Polly was in a bind. She was being evicted, and needed to find a home not only for herself, but the twenty-three rescued cats that lived with her. However, leaving the eviction notice wasn't enough with her landlord, he preferred to yell and terrorize her. Luckily, her next door neighbor always came to her rescue. Simon was gorgeous, and Polly had a secret crush on him. Regardless of the verbal abuse the landlord heaped on him for his stuttering, Simon always made sure that Polly was safe. However, there was only so much Simon could do for her. 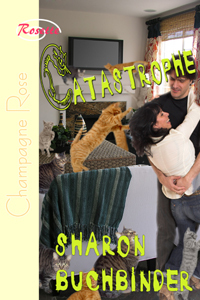 Catastrophe was a sweet short story that any cat, or animal, lover will enjoy. Polly had found herself inundated with homeless cats, and although she was losing her home because of them, she was still determined to do what was best for them. Simon was absolutely adorable as a hero. He may stutter, but had no compunction of standing up and defending Polly against the landlord.